C-can Setup kit (without magnets). Prepared set of C-CAN X-12, w/out magnets. The can looks like the photo. PROSLOT Magnet Clips for C-cans, 1 pc. This is the clips for all 12-group (C-cans) motors. These are custom made of heat treated steel with .050” button heads so your gear wrench will work. The 1/8” self tapping, oversized threads will fix factory stripped endbells. If you race 16D’s, these are the only screws to use. Now chrome plated for corrosion resistance and appearance. 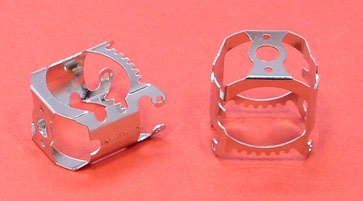 Self tapping Box Stock can & endbell screws. 1/8" long for minimum weight and to provide can screw clearance on Feather set ups. Tighten with standard wheel wrench. Self tapping Box Stock can & endbell screws. 1/8" long for minimum weight and to provide can screw clearance on Feather set ups. Tighten with standard wheel wrench. 24 psc.